The CFHT triennial Users' Meeting will be held at the The Doubletree by Hilton Montréal. The Double Tree by Hilton Montréal is located in the vibrant entertainment district in the heart of downtown Montréal, and is within walking distance from several historic and modern attractions including Old Montreal, the Old Port, Chinatown, the Mont Royal, and many theatres and museums. A welcome reception will take place on Sunday, 19 May, in the Creation Room on the 6th floor of the Double Tree from 4:00pm to 6:00pm. Please indicate your attendance to the welcome reception on the registration form. The registration desk will be open during the reception. A floor plan map of the Double Tree event areas is available here. A meeting dinner has been organized on Tuesday, 21 May, in the Inspiration Room on the 6th Floor of the Double Tree from 6:30pm to 10:00pm. Please note that this event, although subsidized by CFHT, will require a payment of CDN$50; payment will be collected in cash only at the registration desk during registration. While this event is extended to the meeting participants, guests may participate and should be specified when registering to the meeting. Participants are free in their selection for lunch locations. On the main level of the Double-Tree by Hilton there is a food court that is perfect for lunch. The website is the following: Complexe Desjardins. 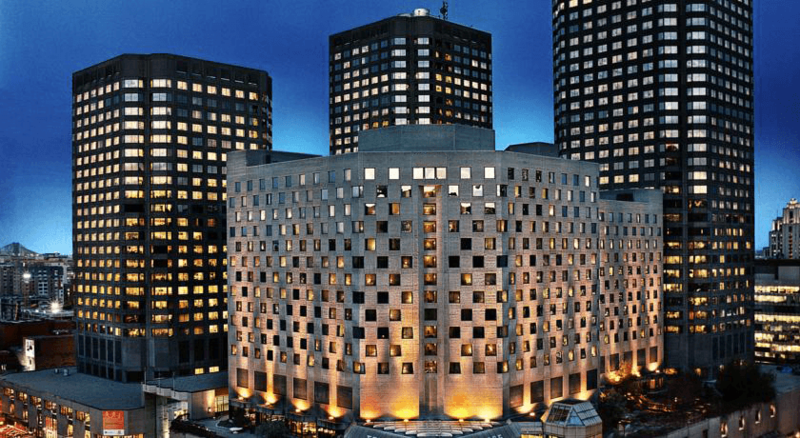 A block of guest rooms has been set aside by the Double Tree by Hilton Montréal at a very favorable rate for the Users' Meeting 2019 participants. Two room types have been chosen - King Bed with single, double and triple rates, and Two Queen Beds with single, double, triple and quad rates. The guest rooms are quoted in Canadian Dollar and exclusive of any applicable taxes, applicable service fees and/or hotel-specific fees in effect at the time of the event. The rates include complimentary wireless internet (5Mbps). After registration has been completed, an email will be sent to registered participants and include a secure link for booking accommodations at the Double Tree. CFHT will not process any payment; the credit card information will be securely transmitted to the hotel, and the hotel will reserve the rooms as requested. The deadline to book rooms at the Double Tree is April 17. Please note that check in and check out times are 4:00pm, and 11:00am respectively. Because of the popularity of Montréal at this time of the year, it is recommended that you make hotel reservations as soon as possible. When making travel arrangements your destination should be Montréal Pierre Elliott Trudeau International Airport (YUL). The airport is located approximately 22 km from the hotel and conference centre, of the Double Tree. The easiest way to go downtown is to take the 747 Aéroport P.E. - Trudeau / Centre-Ville shuttle. The 747 shuttle bus service is the most cost effective and efficient way to travel between the airport and the centre of Montréal and runs 24 hours a day, 7 days a week. Once you leave the Customs Hall, follow the signs for the shuttle bus/navettes just outside the terminal. You should take the 747 Shuttle going towards the Berri-UQAM metro station and get off at Stop #7 right by the Hyatt Regency. The fare is CDN$10. This will also warrant you unlimited travel throughout the STM bus and metro networks for 24 consecutive hours following your fare purchase. The fare card can be purchased at the airport from the automated dispensers which accept cash, debit and credit cards. If paying on-board, only COINS ARE ACCEPTED - NO BANK BILLS. Taxi - Taxi rates are fixed at CDN$40 to downtown, one-way. It is customary to tip the driver anywhere from 10% to 20% with 15% being the average. Visa, MasterCard and American Express are often, although not always, accepted; therefore it is strongly suggested to advise the taxi dispatcher of your desired method of payment. Taxis are readily available outside hotels or can be ordered by phone. Uber - There is a dedicated Uber pickup platform on the 2nd level of the airport (departures) near Door 6. There are signs indicating where to go once you have exited the Customs Hall. Metro and bus - Montréal is a very walkable and safe city. However, if you need to travel larger distances, the public transportation system is very fast and convenient. The Metro (underground subway) typically operates between 5:30am to 1:00am. The bus network is also very extensive. There are a few fare options depending on how often you plan to use the metro/bus. Find out more on the STM website. By Bike Montrealers are avid cyclists and proud of it. The city has 350 kilometres of bike paths criss-crossing its territory, including natural parks and suburbs. Use a Bixi bike to get around. This public bike sharing system can be a great way to get around the city. The cost of 24 hours is CDN$7.00. Users must be careful not to use the bike for more than 30 minutes at a time to avoid being charged extra time. For more information, visit their website at Bixi website. Monday, May 20 2019 is "la journée des patriotes" in Québec and "Victoria Day" elsewhere in Canada. Many stores and services may be closed on this date and buses will likely be operating on a special holiday schedule. Please call ahead or check online before making plans on this day. French is Québec's official language but English is widely spoken in Montréal. The city has more than 120 cultural groups and over 20% of the population speaks three languages. The Canadian currency is the dollar (CDN), which is divided into 100 cents. There are 5, 10, 20, 50, and 100 dollar bills. One and two dollar bills have been replaced by coins, sometimes referred to as "Loonies" (the bird on the $1 is a loon) and "Toonies" ($2). The electricity plugs are 110V and are the same type as in the US. If you come from a country that uses 220V electricity, you may need a converter for any appliance you bring that requires power (computers, chargers,etc.). Service is not included in restaurants, so it is customary to add a 15% tip to the total before taxes (if you are with a group, 15% for service may be automatically added to your bill). Taxi drivers, hairdressers, etc. are also normally tipped 15%. Bellhops, porters, doormen, etc. generally receive at least $1 per suitcase or per service rendered. Montréal switches to Eastern Daylight Time (summer time zone) on the second Sunday of March and returns to Eastern Standard Time (winter time zone) on the first Sunday of November. Montréal is in the GMT-4 time zone. Most shops downtown are open Monday to Wednesday from 9am to 6pm, Thursday to Friday from 9am to 9pm and Saturday and Sunday from 10am to 5pm. They are usually closed on legal holidays but some establishments (supermarkets, SAQ outlets, etc.) may still be open. Montréal has the highest concentration of eateries on the continent with 92 restaurants per square kilometer in touristic neighbourhoods and representing various types of cuisine inspired by 120 countries and regions. There is something for every palate and budget. The Old Port is the historic port of Montréal located in Old Montréal and stretching for over 2km along the St-Lawrence River. Used in the early 17th century as a trading post, it is now a buzzing hive of activities for both tourists and denizens of Montréal. Old Montréal is a maze of charming cobblestone streets where you can dine in a vast selection of restaurants or go into speciality artisan shops. For more information on the Old Port of Montréal and the surrounding area, check out this website. Mont-Royal Park is a peaceful green space nestled in the heart of the island of Montréal. Visitors can partake in a number of acivities including hiking up to the mountain's peek, bird watching and special public programming. For more information on the Mont-Royal Park, how to get there and their activity calendars, consult their website here. Montréal is home to a large number of museums which span the fields of art, history, science and more. For a full list of Montréal's museums and science centres, including special events and exhibitions which may be happening during your stay, see this website. There are always lots of events and a festival or ten going on in Montréal. To find out what is happening during your stay, you may consult the city's Calendar of Activities. For more suggestions on things to do during your visit, you can also check out the Montréal Tourism website.